The Coil T Drill will help you to make sure you are making a complete coil on your backswing. This is important not only for power, but also to help make sure you get the club on plane by using your shoulders to push your arms into position rather than disconnecting your arms from your torso. The Dipping Drill will help you if you tend to stand up in your backswing. Standing up and coming out of your posture can be caused by many things. Among those are tightness, lack of strength in certain muscles and simply poor technique. The results are often fat and thin shots. This drill helps you learn to maintain your posture throughout your backswing. The Rate of Rotation Drill will help you learn to control your distances, accuracy and trajectory by controlling the speed of your swing. Often times a player's speed changes and thus he gets different results and can't control his distance. It is important to control the acceleration point in the swing along with the overall speed to maintain consistency. The Perfect Finish Drill is designed to not only make sure you get all your weight through the shot and end up balanced, but it will also help get the parts of your swing leading up to the finish on track. For instance, if you are swinging too far inside out or too far outside in coming into impact, it is difficult to get your finish on plane. By working backwards and training yourself to get a good finish, you can often correct swing path and balance errors. The Tuck, Turn & Roll Drill is a great drill for any player that struggles with their release. Whether it is casting, releasing early, flipping through impact or lack of body rotation this drill will teach you how to properly deliver the club to impact with force and control. The Toe Curl Drill is designed to help those that get too much weight on their toes at any part of the golf swing. Falling forward can result in shanks, pushes and even hooks. It also makes it very difficult to consistently contact the ball in the sweet spot. The Wide to Narrow Drill is one of my personal favorites for creating lag in the downswing. Good golf swings create a nice wide arc on the backswing and then a more narrow arc on the downswing. As deeper angles are created upon transition, power is increased. One of the most common swing flaws in the game is casting or releasing early which results in not only a huge loss of power, but also loss of control over the clubhead if it passes the player's hands. This drill is a fantastic fix for this oh so common problem. The Back Foot Down Drill is one of my all time favorites and a drill that I use often on the lesson tee. It is designed to help stop a player from lifting the rear foot and kicking the rear knee in too early in the downswing. This is a common move seen among many amateurs, but rarely among professionals. It can cause a hip slide/sway which can result in blocks and pushes or a even a snap hook. As the hips remain overactive, our arms get left in the dust and have to try to play catch up sometimes forcing an early release. The Back Toe Lift Drill is useful for stopping a sway off the ball in the backswing. For those that roll their weight onto the outside of their back foot, this drill will provide a barrier and help keep their weight more centered on the inside of their feet. It is also a big help to those that tend to get on their toes too much in the backswing or the downsing. The Step Through Drill is a fantastic way to learn how to transfer your weight in the downswing and make sure that you finish with 100% of it through the shot. Gary Player made this move famous. Most likely, because of his size he needed to use all of his weight to power the shot and put everything into it that he had. Leaving your weight back not only will rob you of distance, it result in hoards of mishits. 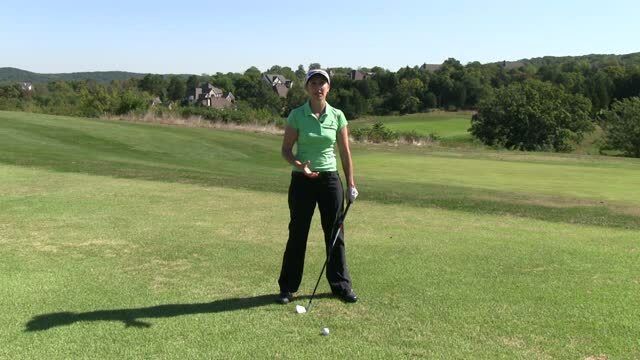 The Toes Up Drill is a great drill for those that tend to get on their toes in the golf swing. Falling onto your toes can cause many misses, most commonly shanks and blocks. We need to make sure that our weight sits in the arches of our feet at address and remains there throughout the swing. The Front Toe Lift Drill helps to keep your front heel on the ground throughout the swing. This helps those that lift their front heel on the backswing to keep it grounded and stable. Also, for those that come off the heels in the downswing or spin out on their front toe, it will help ground the front heel. The 45 Degree Foot Angle Drill is designed to help you solve three problems: 1) Swinging outside/in through impact 2) Sliding, swaying or spinning your hips open through impact 3) Not being able to get your arms to release through the shot If you have problems slicing or pulling or are simply overactive with your hips through impact this is a great drill for you. The Foot Back Drill serves two purposes. First, it is a great drill for helping you to swing on a more inside out path coming into impact. This is useful for those who slice or pull the golf ball. Second, it is a great drill for slowing down your hips and getting them to put on the breaks before impact. This is helpful for players who slide or spin their hips into the ball and can't get their arms through in time. The Hip Stick Drill helps you learn to rotate or open your hips through the shot. This is a great drill for those that lack turn or simply don't get their hips turned early enough in the downswing. It is also very useful in stopping a hip sway or slide into the ball. The Back Foot Out Drill is designed to help you eliminate a huge hip slide or hip spin coming into impact. While we want to use our hips to power the shot, sliding them too much in the downswing can cause errant shots such as a block and spinning them open too early can do the same. Overactive hips are particularly common in junior golfers who are not only super flexible, but look to the lower body where their strength is to get power. The arms are what is connected to the golf swing so we need to get the perfect balance of lower and upper body to maximize distance and control. The Ba Boom Hip Drill gives you the feel for the perfect combination of a bump and turn with your hips coming into impact. Poor swings will have all turn (spinning open) or all slide/sway. This drill will help you to get your weight to your front foot properly while getting the correct amount of hip rotation for maximum power. The Front Foot Out Drill helps you to get your hips open during the downswing. Whether you are tight and not able to get them through or you are having trouble getting them open in time with the correct sequence in your swing, this drill will teach you the correct hip action. The front foot in drill is designed to help those that spin their hips open too early in the downswing or simply over turn them through impact. It is a great drill for stabilizing the lower body and allowing the arms to catch up to the lower body and release freely through impact. The Back Foot in Drill helps to make sure players have proper hip movement in their backswings. 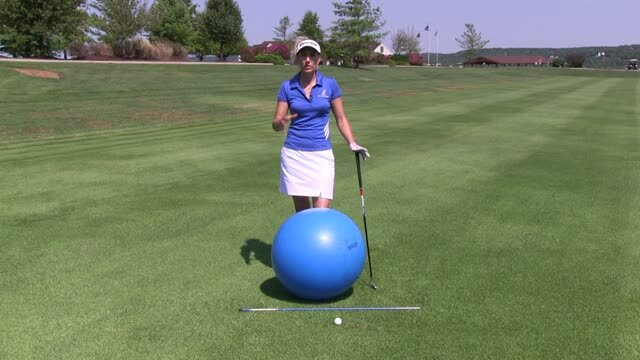 It is designed to both help a golfer who over turns their hips in the backswing as well as help a golfer who sways their hips off the ball during the takeaway. The Rocking Drill is designed to help you feel a natural and smooth weight transfer back and forth from your rear foot to your front foot throughout the golf swing. The Under the Pole drill is designed to help you prevent a hook by avoiding a sever inside/out swing path. The 3 ball drill is a super simple drill designed to help you correct a hook. The Back to the Target Drill is designed to help players that slice because they spin open too quickly at the top of their swing. The Double Pump Drill is a great anti-slicing drill that will help you learn to unwind your upper body while keeping the club on plane. The Dropping Drill is designed to help those that chronically slice the ball because they come over the top. It teaches how to get the club down to the inside and on plane. The Toe Line Drill helps prevent getting the club stuck too far to the inside on both the takeaway and on the downswing. Getting the club trapped too far to the inside causes a variety of mishits. The Roll Down Drill will help get you out of flipping your wrists through impact and hitting fat and thin shots. It will teach you a proper release for more solid contact and improved distance. The Cheek Down Drill teaches you how to maintain the posture you establish at address through impact. This helps to eliminate topped and blocked shots. The Towel Drill for Chunking helps prevent fat shots by teaching you how to move the bottom point of your arc to the golf ball. The Move the Angles Drill teaches you how to release your club properly at the moment of impact. Releasing the club too soon results in loss of power and control. Move the Angles Drill will show you how to maintain power and control until the last possible second. The Level Out Drill teaches you to flatten your swing plane and angle of attack to help prevent hitting down too steep and behind the ball. The Feet Together for Stability Drill helps you eliminate a lateral sway and learn to pivot in place. This will result in a clean hit as opposed to fat and thin shots and more accuracy. The Chase the Ball Drill helps you stop chunking and hitting behind the ball by training you to get your weight through the shot. The Swing on a String Drill allows you to monitor your club head path in your golf swing to ensure you are not coming too far inside/out or outside/in. The Weight Forward Drill teaches you to get on your front foot and remain balanced there through the finish of your swing. The Impact Point Drill helps address fat or thin shots and trains you to bottom your club out at the proper point in your swing. The Front Foot Only Drill will help eliminate chunking the ball by forcing you to keep your weight forward through the shot. The Forward Press Drill helps train you on getting to the proper impact position, if you are hitting chunky, thin or fat shots, this drill can help. The Stable Legs Drill forces you to maintain a stable lower body throughout your swing and helps eliminate a sway, reverse weight shift and reverse pivot. The Stepping Drill teaches you how to shift your weight through your swing creating more power and to keep your body in the correct sequence. The Elevate your Foot Drill helps you to prevent scooping and avoid a reverse spine tilt. The Rear Foot Only Drill helps you maintain balance while keeping your upper spine behind the ball through impact. The Front Foot Drill trains you to have the proper weight distribution at impact and helps eliminate topped and fat shots. The Towel Drill is a great drill to practice to help you steepen your angle of attack on the ball and learn to take a divot. The Handful of Pennies Drill helps you avoid topped shots by forcing you to hit down on the ball and take a divot. The Connection Towel Drill will help ensure your arms are connected to your body during the swing, if they are disconnected, this could be a cause for shanking and other errant shots. The Swing Plane Poles Drill helps diagnose an outside-in or inside-out path error as the cause for the shanks. The Range Bucket Drill can help eliminate the shanks by preventing you from swinging too far from the inside and catching the hosel. The 3 Tee Drill is another shank curing drill, that helps you groove the proper swing path through impact to avoid hitting it off the hosel. The 2 Ball Drill is another drill to help you overcome or avoid the shanks by helping you come down more on plane and avoid swinging too much inside/out on the way down. The Miss the Ball Drill helps eliminate shanks by teaching you to stop swinging too much inside/out on the way down. The 2x4 Shank Cure Drill helps you overcome the shanks by ensuring you are not swinging too far outside-in or inside-out. The Parallel or Pointed Drill helps you easily monitor your golf swing to ensure you remain on plane throughout your swing. The Under a String Drill helps you groove your golf swing on takeaway and after impact to make sure you are not coming back too far inside or even over the top. The 2 Clubs, One Hand Drill is a simple drill that allows you to evaluate if your swing is on plane. The Flashlight Drill helps train you to ensure your swing stays on plane throughout. The Swing Plane Mirror Drill teaches you how to monitor and groove your swing so it stays on plane. The Swing Plane Track Drill helps you make sure you are keeping your swing on plane every time. The Swing Plane Tee Drill is an easy way to make sure you are on plane throughout your swing. The Seam on Your Shirt Drill helps you keep your rear arm in front of you to prevent the various problems from getting it stuck behind your body. The Rear Arm Headcover Drill forces you to keep your right elbow on its proper plane throughout your golf swing. The Right Elbow Mirror Drill helps you ensure you keep your right elbow on plane throughout your swing to enable you to become much more accurate.